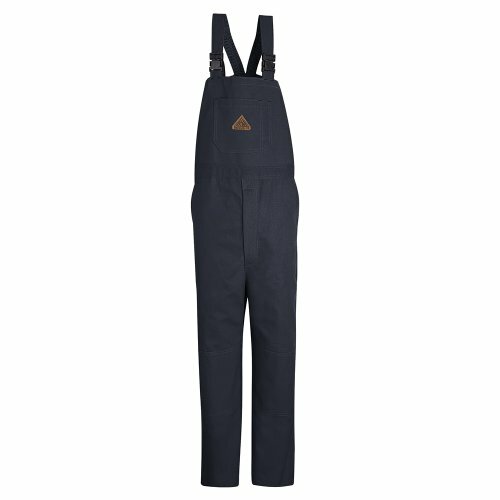 Bulwark Excel FR ComforTouch duck unlined bib overall. Fabric made of 11.0 ounces, duck, 88 percent cotton/12 percent nylon. Nomex taped brass zipper fly front. Elastic in straps. Non-conductive heavy-duty release buckle. One large front bib pocket with pencil stall. Two set-in swing pockets, watch pocket, two large hip pockets, hammer loop, double tool pocket. Side vent openings with snap closure. Reinforced double knees. Home wash and industrial wash.